This week I planned on making lunch for some friends, but two sick kids made us mix up our plans a bit. So I had the ingredients for a yummy dinner on hand when our early-release Wednesday rolled around and some one-on-one time with Jack too (I've been experimenting with keeping the girls up & then having them start nap after our school pick-up). It's been a long time since we've cooked together and it was a LOT of fun! It's especially nice now that he is getting bigger (and more trustworthy) as I can have him do a few more of the "dangerous" aspects. We quickly had dessert chilling in the fridge and and a simmering crockpot of white chicken chili (and quite a mess!). So I cleaned up, got EJ up from nap and set to working with her to make homemade cornbread (something I've never done before, but it was so easy and SO yummy!). Cooking time with both my big kids? It was so awesome! And it was the perfect dinner for our first dinner with Matt for the week (darn night classes)...a little something special that the kids tool great pride in having made themselves! Jack even served as our waiter for the evening (he had some spare time while I heated up some tomato soup for him). 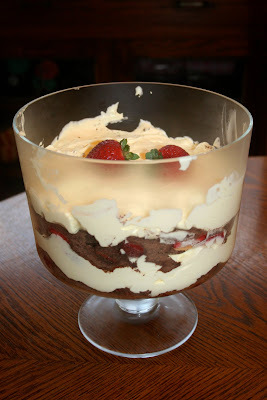 I loved the "grown-up" trifle as assembled by Jack! It was still yummy, but Jack & I have already brainstormed a new version...more kid-friendly & easier to make (which means I don't get stuck grating chocolate next time for sure!). I can't wait for another "special" occasion to try out our new recipe! It looks so good! Now my stomach is growling :-) Think I may need to get the recipe for that white chicken chili - YUM! Hate that we weren't able to enjoy lunch at your house but LOVE that you were able to use it to have cooking time with Jack & EJ. Those are the moments they'll remember forever! some of my best childhood memories are from moments in the kitchen. YUM! Love getting my girls in the kitchen. Today my little one, grandma and I tackled homemade applesauce and apple crisp. Some of the best memories are made in the kitchen.